The average rural Minnesotan currently wears six (and often more!) leadership hats and as the rural population ages, the leadership demand is only increasing. Leadership capacity is maxed out, said University of Minnesota Extension sociologist Ben Winchester during a fall 2014 webinar. With demand increasing faster than supply, it’s important to understand, and plan, for the future of rural community leadership. We’ve been doing this for some time at Blandin Foundation through our Rural Pulse survey. 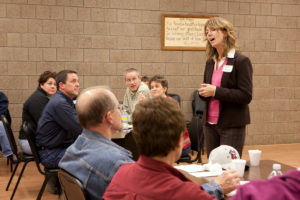 Asking the question, “Would you consider serving in leadership if you were asked?” we’ve been able to ascertain rural Minnesota’s appetite for entering into emerging leadership opportunities. Just to give you a taste, in our 2013 Rural Pulse, 34% of respondents answered yes, 19% said maybe and 47% said no. In the same webinar, Winchester pointed to Nebraska’s Rural Poll as a measure of how many current people serve in leadership roles, using the question: Do you think you’ve held a leadership role? While the questions seek different answers, the way they’re framed got us thinking – how do community leaders emerge? Are they asked or do they step up? Alternatively, if a community believes that leaders need to be asked, more time and attention might go into developing personal connections with potential leaders. This could lead to leadership program development, mentorship opportunities, networking events and more. The issue really traces back to the age-old question: are leaders born or made? In a 2012 Center for Creative Leadership study of 361 business executives, 19.1 % of respondents believed that leaders are born, 52.4% believed they are made and 28.5% believed they are equally born and made. Just like the division in the perception of leadership, genetic research also shows a leadership split – 30 percent resulting from genetics and 70 percent as a result of lessons learned through life experiences. So if 70 percent of the qualities of a leader are cultivated through life experience (hence they’re 70 percent “made”), what should we be doing in rural communities to ensure we have enough leaders for the future? Post your thoughts below!